Anyone wanting to learn more about making Clissett-type chairs might consider getting hold of a copy of Mike Abbott's book Living Wood. It's based on years of practical experience, as well as study of Philip Clissett's chairs. Mike also runs courses for those who want to try their hand at making a Clissett-type chair. There are plenty of other courses around, but particular mention should be made of those held at Clissett Wood, adjacent to Philip's cottage. They are run by Gudrun Leitz, and you can find out more about them here. 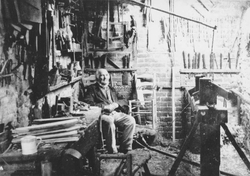 Be aware, though, that Clissett Wood courses are about Windsor chair making, rather than Clissett-type framed chairs.